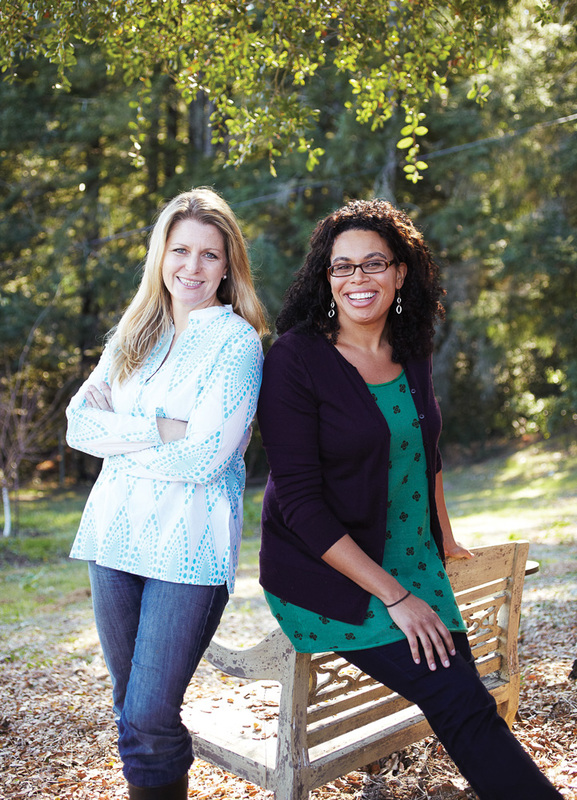 Veggies, fruits and herbs take center stage: Leslie Bennett (right) and Stefani Bittner, co-owners of Star Apple Edible + Fine Gardening, a San Francisco Bay Area landscape design firm focusing on aesthetic edible gardening, and co-authors of The Beautiful Edible Garden. All photos reprinted with permission from The Beautiful Edible Garden by Leslie Bennett and Stefani Bittner (Ten Speed Press, © 2013). Editor Shannon Roxborough chats with Leslie Bennett, half of the creative team behind Star Apple Edible + Fine Gardening, a firm that is beautifying one food garden at a time, about their book, where it all started and edible landscapes that are as devoted to verdant sanctuary as they are to providing organic sustenance. 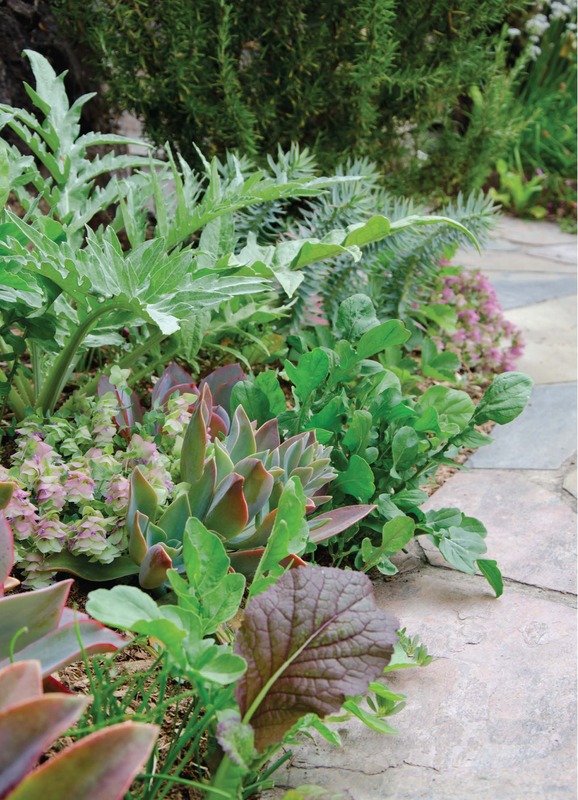 Edible gardens satisfy a sense of horticultural accomplishment as much as they nourish the body, but tend to lag well behind ornamental landscapes when it comes to visual appeal. 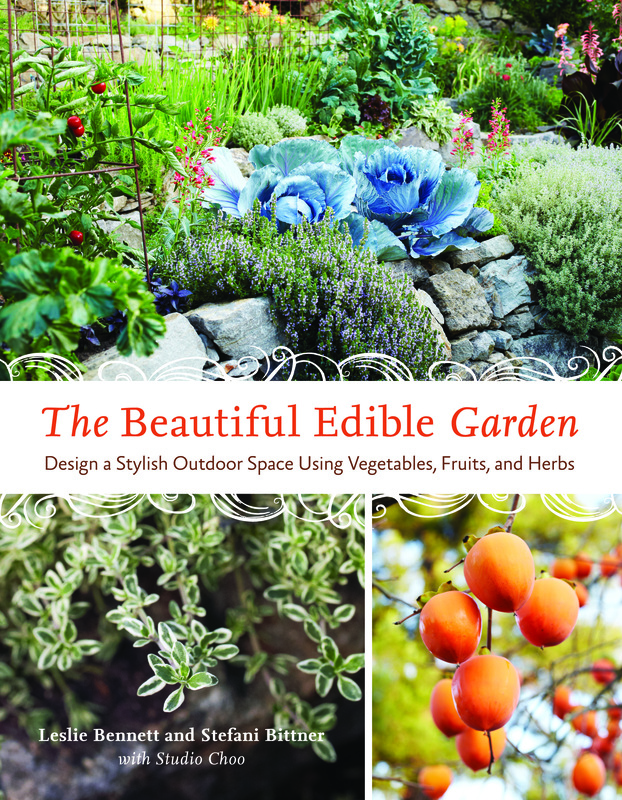 Not so in the case of the eye-pleasing food-bearing edens created by Leslie Bennett and Stefani Bittner, co-authors of The Beautiful Edible Garden: Design a Stylish Outdoor Space Using Vegetables, Fruits, and Herbs, required reading for anyone interested in having an attractive food garden. In their designs, edible plants unexpectedly double as decorative vegetation in an artful marriage of form and function. A onetime lawyer who left the legal world for greener pastures, Bennett, who had never gardened until six years ago, cut her teeth at small-scale organic farms in the U.S., England and Jamaica, where she learned the finer points of growing food, biodynamic practices and permaculture. These days, she and her design partner stay busy skillfully planning, fashioning and tending to an ongoing string of livable and sustainable food-producing outdoor spaces across the Bay area. Here, Bennett talks shop. Q. How did you conceive the concept of designing edible gardens that are not only practical but beautiful? A. It came to me pretty clearly. I thought it was meaningful to use food to create nice-looking spaces where people could not only spend time but see their vegetables more often, keep an eye on them and give them more TLC. It was something that just felt natural and turned out to be win-win situation. A. We wanted to give gardeners and people who love gardens a starting point and resource for ideas. Though we have trained designers on staff, when Stefani and I started designing gardens neither of us had any formal design experience. To be completely honest, it was hard. There was very little information out there to use as a guide on how to integrate food into spaces in an appealing way. We learned a lot about how to do things over five years through trial and error. Ninety percent of the gardens shown in the book were created during this period. Q. What do you hope readers will take away from it? A. We believe that if you’re growing food, your whole landscape should have an organic sensibility, so we hope to convert more people to organic care, which is something that requires time and effort. In our view, taking care of things organically is important, whether you plan to use your outdoor space primarily for food or mostly for spending personal time or social gatherings. I think the real idea is emphasizing that even while focused on growing food you can still have a beautiful garden that fits with your lifestyle. Our book is very DIY and we hope it will empower and inspire people everywhere who want to create beautiful edible landscapes. Q. What advice do you have for people who want to design their own edible organic gardens? A. Just focus on the soil. It may sound like a simple answer, but it really is the most important thing. Work on amending, improving and loving it and your plants will be much stronger, more beautiful and healthier. It helps to take a second look at the foods you eat and the plants you like and really consider their production and ornamental qualities to see how they can be incorporated into the landscape. After a while, you’ll find yourself approaching every edible as both food and in terms of how it looks. Also, keep in mind that it’s always interesting to try new things. For example, I personally think persimmon trees are gorgeous, but I’m trying avocados right now as a landscape tree. They’re not the most graceful things…actually, they’re really wonky. But if you only ask them to do what they’re good at and put them in a place where they’re going to play off of other plantings, they can be beautiful, too. The same can be applied almost any less-than-pretty edible that has trouble standing on its own. Q. Is there anything else you’d like to say to GV readers? A. There’s nothing like having a space that offers food to eat and an inspiring place to spend time or help you get through your day. I really genuinely believe that food and beauty go hand in hand, so it doesn’t matter if you have no yard at all or large property with room to spare, there’s some kind of beautiful edible garden that is accessible for you. For more information on Leslie and Stefani’s work, visit starappleediblegardens.com. Comments have been edited and condensed. The book’s cover. Courtesy of Ten Speed Press. Tomato arch. Photo by David Fenton. Succulent vegetable pathway. Photo by Jill Rizzo. Meet provides pithy profiles of and interviews with influential and up-and-coming talents, forces and authors in the fields of gardening, horticulture, botany, landscape design, outdoor decorating, food & drink and organic and natural products. 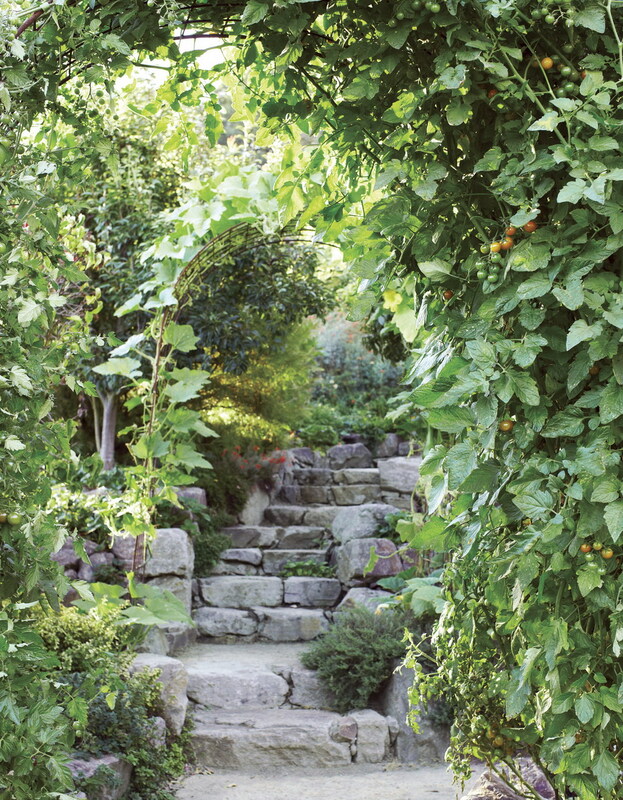 This entry was posted in Edible Garden, Food, Garden Design, Uncategorized and tagged Bay area garden design, Bay area landscape design, edible gardens, Leslie Bennett, San Francisco garden design, San Francisco landscpae design, Star Apple Edible + Fine Gardening, Stefani Bittner, The Beautiful Edible Garden. Bookmark the permalink. I like the idea of a pretty edible garden (as would my mother in law who can’t stand to see my carrots where she considers I should have hostas), but how would that work with crop rotation? If you keep putting in your pretty reg cabbages in the same spot surely they’ll start to suffer. This is a great question — crop rotation is really important for growing healthy, and thereby beautiful vegetables. Fortunately, there’s lots of things that can be rotated in place of a red cabbage: if you are seeking other vegetables that offer that nice, contrasting dark red/purple foliage, you can try bulls blood beets, red lettuces, red chard, edible viola flowers, or purple orach. Or, if you’re adding annual vegetables to a mixed ornamental planting bed and just want a vegetable that will look good — anything relatively compact and tidy looking will do the trick. I love using leeks, onions, celery, eggplants and peppers as pretty, edible additions to an ornamental flower bed. I hope this helps! Oh, yes, persimmons! Totally beautiful among trees. I do vine tomatoes (sungold) on trellising by my front porch and the children of my clients help themselves, moms knowing I never spray. I love to see their young eyes light up at the taste of a fresh, tiny tomato, picked-by-self, in the cool of the morning.